There is no denying that limestone tiles are beautiful – they have a unique beauty that cannot be matched by even the best quality porcelain tiles and installing them is a great home improvement project that can add value to your home. But there is also no denying that they need regular maintenance to stay looking as good as new (whereas porcelain tiles need very little, if any, maintenance). 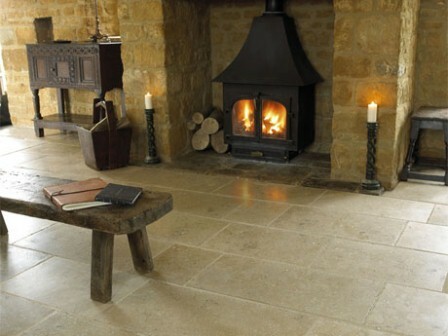 Limestone tiles come in a variety of finishes including polished or honed finishes with the polished finish having a high shine due to the buffing in the factory with a diamond tipped grinding machine and the honed finish, whilst still being very flat with few flaws, has a matt finish. Each finish has its advantages and disadvantages: a polished finish looks fabulous but can be easily scratched and marked, whereas a honed finish is much more resilient to damage but can very quickly start to look dull. Other finishes include tumbled limestone tiles which are, quite literally, tumbled in a drum to create natural looking rough edges that add to the character and charm of the tiles. And also brushed finishes where hard bristles are used to create a bumpy yet still smooth surface. Certain limestone tiles are treated with a wax coating which can be buffed to a shiny finish offering the opportunity to have a tile with rough edges yet smooth to the touch. These sorts of tiles are beautiful but maintenance of them is a hard, ongoing job. The wax tends to wear off easily and quickly in a busy family bathroom and cleaning fluids aid the ease with which the wax wears off; it does not have the more permanent effect of a tile sealant. Limestone tiles without their protective wax coating are very susceptible to marking and staining from soap and other bathing products. Bear in mind that waxed tiles cannot be sealed and tiles, once sealed cannot be waxed as the products do not work well together. So the answer to maintaining limestone tiles is to use the product recommended by the tile supplier (or manufacturer) and prevent problems occurring in the first place. The other alternative is to forgo the unique beauty of natural stone and take the easy option of (almost) maintenance-free porcelain or ceramic tiles.